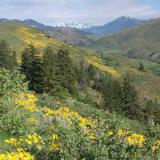 Geologically, the Okanogan ecoregion is a complex story of plate tectonics, volcanic eruptions, and ice age sculpting. The Okanogan was once its own micro-continent. This micro-continent collided 100 million years ago with the mass of North America, resulting in the highlands of today. Some of Washington’s oldest Precambrian metamorphic and sedimentary rock underlies the eastern part of the Okanogan. Over the following tumultuous eons, Cambrian sandstone and limestone have layered over the region. They’ve left it rich in minerals such as gold, lead, zinc, and quartzite. Fossils, too, are found near Republic, where an ancient lake bed holds the fossilized remains of plants, fish, and insects. During the Pleistocene, glaciers covered much of the Okanogan. Their final retreat shaped the face of the ecoregion today. Evidence of glaciers can be seen along the mile-wide floodplain of the Okanogan River. Glaciers left terraces of till (sand and gravel) standing up to 500 feet above the river. Mountaintops that rise above 8,000 feet and broad river valleys that dip below 800 feet reflect the diversity of the Okanogan landscape. The alpine peaks of the Pasayten Wilderness in the west are separated from the Kettle Range by the low-lying Okanogan Valley. The Columbia River forms the ecoregion’s southern boundary. At the Grand Coulee Dam it becomes Franklin D. Roosevelt Lake. This waterway takes a northward turn toward its headwaters in Canada, dividing the Kettle Range and the Selkirk Mountains.